With a federal election less than a year away, Canada's defence minister is warning voters they will be targeted by online cyberattacks and fake news as Russia steps up its efforts to undermine Western democracies. 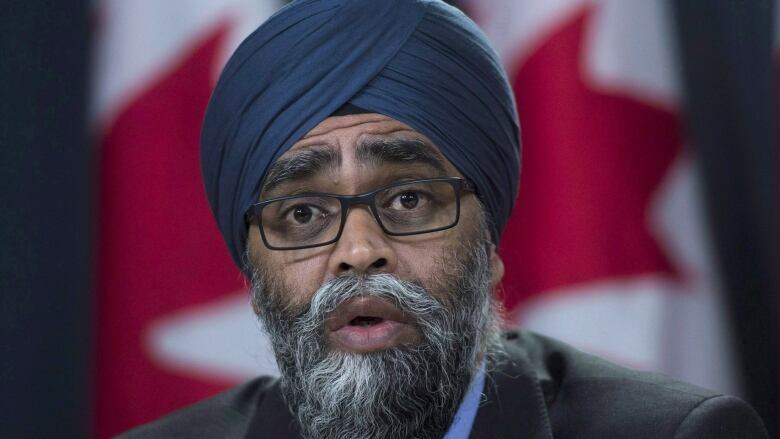 "We have taken this into account very seriously in our defence policy," Harjit Sajjan said in an interview with The Canadian Press. "We need to further educate our citizens about the impact of fake news. No one wants to be duped by anybody." "When we stand up for human rights, and when we stand up ... to nations like Russia who are going against the rules-based order ... you become a target," Sajjan said, adding that Canada's decision to protest Russia's annexation of Crimea has also raised Russia's ire. He said the Canadian government has a cybersecurity plan that includes establishing the Canadian Centre for Cyber Security within the Communications Security Establishment, which is focused on collecting foreign signals intelligence. The report, presented Sunday to a NATO Parliamentary Assembly meeting in Halifax, was discussed by NATO's science and technology committee. U.S. Democratic congresswoman Susan Davis told the committee that Russian interference continued in the early stages of the recent U.S. midterm elections, although not on the scale seen during the 2016 election that saw Donald Trump elected president. "There's a lot of creativity among the bad guys," she said in an interview Sunday. "The Russians are pumping out a lot of reports about misbehaviour of Canadian troops and how expensive the [battle group] is for Latvia," she said, adding that Canadian soldiers have taken a proactive role by letting local residents know why they are there. "It's a great example of how Canada ... has made a difference pushing back against disinformation." "In the case of Canada, [the Russians] would find it very interesting to try to destabilize your relationship with the United States," said Neville-Jones, who was David Cameron's national security adviser before he became prime minister of Britain. "That gets at the sinews of Western democracy. It gets at the sinews of NATO relationships." Neville-Jones said the rise of social media has eroded the influence of traditional media sources, which has left citizens more susceptible to cyberattacks. The best defence against fake news, she said, is to seek other news sources. "Propaganda ... has been one of the things they've always done," Neville-Jones said. "They see international relations as a zero-sum game. If you're losing, then I'm winning." A previous version of this story referred to the Communications Security Establishment as a domestic spy agency. In fact, it's responsible for collecting foreign signals intelligence.